Dental crowns are prosthetics for your teeth. Your dental crown cost in the Bronx varies according to the type of material you choose to have it made from and how important your appearance is to you. Teeth crowns are used by our dentists (open on Saturday) as part of a plan to save your natural teeth. Also known as dental caps, they can enhance your appearance when put in place by a top Bronx dentist proficient in cosmetic and family dentistry. Dental caps are fitted, tooth-shaped crowns that are placed over a tooth to protect a damaged tooth and return it to its original shape, size and strength. Crowns also improve the tooth’s function and appearance. When teeth crowns are glued into place, they completely cover the original tooth, right down to the gum line. Stainless steel. These are used as a temporary measure to protect a tooth or filling during the time that a permanent crown is being made. Stainless steel tooth caps are also common for children, as they don’t require multiple visits to the dentist and are more cost-effective. Metals alloys with high gold or platinum properties. These crowns withstand biting well and last the longest. They rarely chip or break. One reason these may not be the best crown for you is because of the highly noticeable silver or gold color. 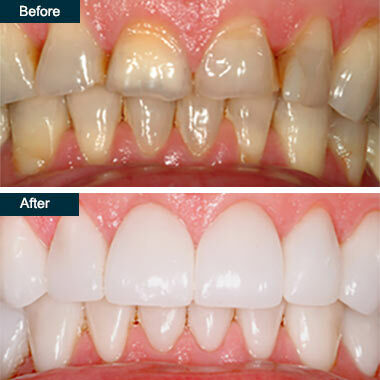 Porcelain dental crowns can be color-matched to your teeth. The downside to these kinds of dental caps is that they are more susceptible to wearing down. They can also chip and break easily. Porcelain-fused-to-metal crowns provide the needed strength for a tooth to function properly. Ceramic composite. Like porcelain, these crowns can be color-matched to your teeth. They’re much cheaper than porcelain, but they don’t last as long. They tend to wear down over time, and they chip or break more frequently than porcelain. Dental crown cost is mainly determined by the material used to create your permanent dental cap. Many kinds of materials are available to be used as teeth crowns, and each fulfills different needs your tooth may have. Depending on various factors, your dental crown cost can be anywhere between $1,000 and $3,500, but caps can last from 10 to 15 years with the proper care. To prepare a tooth to receive a permanent dental cap, your dentist requires you to make two visits. Make sure you’re able to find time off work or school. Of course, the best way is to locate a dentist open on Saturday or a dentist open on Sunday. The first visit includes an examination and preparation of the tooth, and the second deals with the actual placement of the crown over your tooth. During the first visit, your dentist takes X-rays of the tooth. Then he files or adds filing to your tooth to prepare the tooth for the proper placement of the crown. After the tooth is reshaped, an impression is made to create the right fit for your crown. During the second visit, the temporary crown is removed and the permanent crown is placed and cemented in. Immediately after the placement procedure during your second visit, your capped tooth may be a little sensitive. The most common discomfort includes heat and cold sensitivity. Your dentist may recommend that you use a special kind of toothpaste that’s made for sensitive teeth, at least for the first few weeks. The sensitivity gradually fades, so you don’t need to use the special toothpaste forever. Other problems you might encounter include damaging or losing your dental cap. Crowns made completely of porcelain can chip easily if you’re not careful. If the chip is minor, dental bonding can be used to fix the chip. A severe crack, however, can result in the need to replace the cap with a new crown. If the dental cap is loose or falls off, contact your dentist immediately if you have any hope of salvaging it. Do you have any questions about dental porcelain crowns, teeth crowns (ceramic, zirconia) in the Bronx NYC? For more information or to schedule an appointment with the best cosmetic dentist in the Dentist in the Bronx dentistry center, please contact our dental clinic for a consultation.